Bing is introducing quick changes – last month, it was the social sidebar that lets you ask friends for ideas and recommendations as you search. Now you can involve even more of your Facebook friends by typing their name and tagging them when sharing a search. 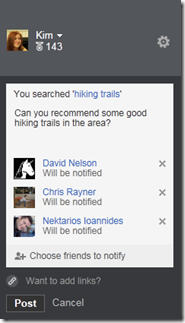 When a user does a search, she can enter a question or comment in the sidebar and then type the names of up to five Facebook friends, the blog post says. That way she can get search results and information from people she trusts. Have have a friend who’s a travel guru and can help you plan a summer vacation? A foodie who can lend some suggestions for your next backyard barbecue? Or maybe you’re searching for great hiking trails and want your friends to tag along. When searching on Bing, simply enter a question or comment in the sidebar and type the name of a friend on Facebook to tag him or her (you can tag up to five friends at a time). With your permission, the question will post on your Facebook timeline, and your tagged friends will be notified so that they can pitch in and help you find what you’re looking for. Remember – you are always in control of what you share through the sidebar. The move to further integrate Facebook with Bing is another step forward in Microsoft’s relationship with the world’s biggest social network. Social powered Search is the future and despite having best search engine, Google’s futile efforts in social networks have been well known. Probably they should have done the same as Microsoft – tie up with Facebook instead of competing against them. It is not that Google didn’t attempt a tie up. Google made social search deals with Facebook and Twitter late in 2009, but both deals came to an end and were never renewed. Bing, however, still has a social search deal going with Facebook, as well as with Twitter, while Google relies on Google+. Having a partnership with Facebook, which has more than 900 million global users, thus gives Bing an advantage in its social search, compared with Google+, which has nearly 111 million users worldwide. It is anybody’s guess, which platform is the most active!